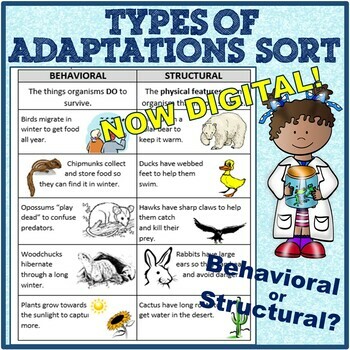 Students sort examples (and definitions) with pictures of Structural and Behavioral Adaptations and create a notes sheet for reference. 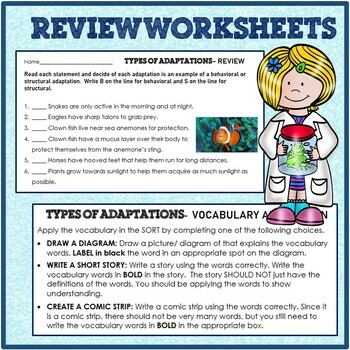 NEWLY included: A 6-question 1/2 sheet to use as a class starter or exit ticket AND a vocabulary review application project where students use the sort words in a diagram, story or comic strip. THIS PRODUCT IS PART OF THE FOLLOWING BUNDLE-CHECK IT OUT FOR A DEAL! 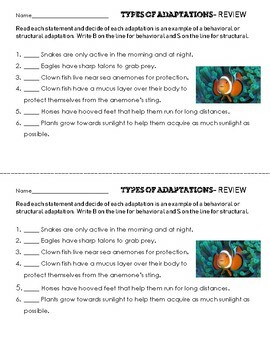 More great stuff on Ecology and Adaptations! 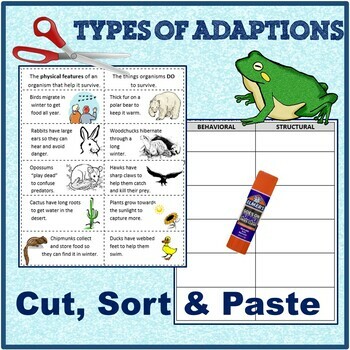 *Animal Adaptations Observations Research Graphic Organizer-quick and easy!